These Death Valley pictures take you on a photo tour of the most common sights in the nation's largest national park. If you can't go there, or want to see what it looks like before you go, enjoy! Death Valley is located on California's southeastern border, actually closer to Las Vegas than it is to any of California's big cities. No matter where you're coming from to visit, our photo tour starts in Baker, off I-15, 94 miles west of Las Vegas and 177 miles east of Los Angeles. Exit I-15 going north on CA Hwy 127. On the way to Death Valley, you'll pass through the towns of Tecopa and Shoshone. At Shoshone, take CA Hwy 127 toward Furnace Creek and Death Valley and travel about 30 miles west before the road turns north. No matter which route you choose to get into Death Valley, you'll climb to almost 5,000 feet before dropping down into the valley floor. We think this route over Salsberry Pass is the most scenic - and it's easily driveable, as long as you don't have a really long vehicle or vehicle/trailer combination. With the temperature rising 14 degrees while the road drops 3,200 feet from Salsberry Pass to below sea level, it's hard to resist comparisons with Dante's Inferno. On the way to Furnace Creek, you'll pass the ruins of Ashford Mill and Lake Manly, a seasonal lake that only has water in it after big rains, and even then only for a short time. The last 15 miles of the drive are the most sight-filled, starting at Badwater, where the elevation sinks of 292 feet below sea level. In a good year, the southern part of this drive is also the best place to see wildflowers in Death Valley. The key to a great Death Valley wildflower display is ample winter rain. The best blooms occur when the first rain falls in September or October, followed by above average rain over the winter. Water isn't enough, though. It also takes warmth - and the wind can't blow too much, or it will dry everything out. When a year comes that gets everything right, Death Valley wildflower blooms are spectacular, but the ​blooms are fleeting. Most of the showy desert wildflowers are in a hurry to sprout, grow and go to seed before the heat and dryness return. Death Valley wildflower blooms start in the lower elevations - usually - mid-February through mid-April. Wildflowers may still be blooming in Death Valley's highest elevations (over 5,000 feet) into July. In 2005 and 2016, Death Valley experienced perfect conditions that led to a wildflower season so spectacular that it made the news all over the country. Not every year will see wildflowers that abundant, but you'll find some nice blooms almost every year. You'll find wildflower updates linked from the Death Valley website, usually starting in late winter and issued once a week at its most frequent. Here's what I tried in 2010: Hotel capacity is limited, so based on early information and general peak bloom dates, I reserved a room at the Furnace Creek Inn a couple of months in advance. With the last date to cancel the reservation coming up, I consulted the website's latest report and concluded that we would be too early for the wildflowers, by about two weeks. I canceled the reservation and as expected, found a date two weeks later sold out. If you go during the general bloom time, you're likely to see something - and are more likely to retain your sanity (and composure) in the process. The photo above was taken during the 2016 Death Valley wildflower bloom season. Before you get started on this tour, here's How to Get to Death Valley. If you're going to stick around, you'll also need the information in this Death Valley Guide. Badwater is the lowest place in western hemisphere and the eighth-lowest spot in the world. Along with Salton Sea south of Palm Springs (-227 feet), it makes the United States the only country to have two locations among the world's lowest places. Although the precise location of the lowest point (-292 feet) is not marked, a walk from the parking area leads past the salt-laden, bad-tasting watering holes that inspired the place's name. The white material you see at Badwater is mostly the same as common table salt, mixed with calcite, gypsum, and borax. Cycles of water and dryness constantly change how the salts look. This photo was taken in February of a somewhat-rainy year, when you could see more water than at other times. If you've seen one of those gorgeous photos of the salt pan, with all those little "walls" formed by the evaporation, you may not find them during a dry year. When we visited in early 2014 after an especially dry period, the elements had more or less leveled the entire surface. The white material you see at Badwater is mostly the same as common table salt, mixed with calcite, gypsum, and borax. Cycles of water and dryness constantly change how the salts look. This photo was taken in February of a somewhat-rainy year, when you could see more water than at other times. Geologists call this area an example of "basin and range," but in plain English that just means it's being pulled apart. The Panamint and Black Mountain ranges are rising on either side of Death Valley, causing the valley floor to sink like a basin. Erosion does its part, washing debris out of the mountains and into the void - dumping almost 9,000 feet of sand, gravel and silt in millions of floods - but it can't keep up, so the valley floor sinks faster than it fills up. In the parking lot, turn away from Badwater and look up on the hillside for a small sign that proclaims "sea level." It's the best way to get an idea of just how low Badwater really is. Badwater is also officially the hottest place on earth and it's only few degrees cooler in other parts of the park in mid-summer. Check these average temperatures and rainfall to get an idea of how bad it can get. Going north from Badwater, you'll come to the Devil's Golf Course. This area, the remains of Death Valley's last lake, which disappeared over 2,000 years ago is high enough that the periodic floods don't smooth it out. The lumpy surface is formed when salty water rises up through the mud. As the water evaporates, it leaves little pillars of salt behind. A side drive from the main road takes you to Artist's Palette. Located on the east side of the valley and a few miles north of Badwater, Artist's Palette is reached by a one-way, paved road called Artist's Drive. It's a 9-mile loop road, passable by passenger vehicles but with turns too sharp for anything longer than 25 feet. The feature here is the dizzying array of colors in the volcanic and sedimentary rocks that form the hills. Driving in, you'll see a variety of red-browns, but the real treat is at the overlook called Artist's Palette, where hues from purples through greens appear. Hot water played a part in forming this colorful landscape, bringing in minerals that give the rocks their colors. The formations are especially pretty (and photogenic) in late afternoon light. Looking like a giant's honeycomb, but made of salt, this landscape goes on for miles. Mud and salt lies beneath the surface here. Summer heat dries and cracks the surface, and more water evaporates through them, leaving the salt behind and creating the raised "walls." Continuing north, you'll come to Golden Canyon. This water-carved canyon near the Furnace Creek Inn is a good place for a shuttle hike if you have two vehicles. The trail starts at the mouth of the canyon, 160 feet (49m) below sea level, and climbs to about 300 feet (91m) within the first mile. This guide tells you how to take the hike. When you reach the intersection of CA Hwy 178 and CA Hwy 190, you can continue straight north to Furnace Creek and other sights in Death Valley. A short side trip (about 2 miles) on Hwy 190 will take you to Zabriskie Point, which sits about 750 feet above the valley you just drove through, with Gower Gulch in the foreground. The landscape at Zabriskie Point is often called "badlands" which is any dry area with deeply-eroded soft rocks and clay-rich soil. This view looks west across the badlands, back down into Death Valley and to the mountains on the opposite side. The black rock layer is lava that oozed into an ancient lake bed. Hot water brought minerals into the mix - borax, gypsum, calcite - creating the colorful layers. From the parking lot, you have several options. The easiest is the slightly steep but paved, 100-yard-long trail up the hill to Zabriskie Point, where you can see down into the badlands that surround you, and over them into the valley. For a closer look, several hiking trails start from here. The 2.5-mile Badlands Loop brings you back to your starting point, but to do the hike to Golden Canyon Trailhead, you'll need a second vehicle on the other side - or be prepared for a very long hike out and back. Before starting any of these hikes, have a chat with one of the rangers at the Furnace Creek Visitor Center. They can update you on current conditions and help you decide if the hike you're considering is right for you. Continue about 25 miles past Zabriskie Point on CA Hwy 190 going southeast and you'll reach Death Valley Junction and the Amorgosa Opera House. From there, if you're going to Las Vegas, follow the signs (which are more efficient then many GPS systems). If you're leaving Death Valley, you can just keep going south on CA Hwy 127 and you'll return to Shoshone, one of towns on the way into the valley on this photo tour. Take the turnoff about 8 miles past Zabriskie Point to reach Dante's View, which is over a mile above the valley floor. The road to the viewpoint is not suitable for vehicles over 25 feet long, even though it looks easy when you start in, but the last quarter miles is steep (15% grade) and full of hairpin turns. If you're towing a trailer, you'll find two places to park it. The elevation at Dante's View is 5,475 feet, facing west with an unobstructed view of the Panamint Mountains and Badwater basin. On a very clear day, you might even see the highest and lowest points in the United States - Mt. Whitney and Badwater - at the same time. Any day, it will be 15°F or more cooler here than at sea level, and since the best time to go is in the morning, that means you'll probably need an extra layer of clothing. The big sign near the parking area will clue you in to everything you can see. The Dante who inspired the point's name is Italian writer Dante Alighieri, who wrote the Divine Comedy which describes the nine circles of Hell, acquiring its moniker when officials of the Pacific Coast Borax Company visited here in 1929. No matter what you decide to do on this detour, if you want to see more of Death Valley, head back northwest (the way you came) on CA Hwy 190 to Furnace Creek, just north of where Hwy 127 intersects Hwy 190. Furnace Creek Resort is at the center of Death Valley's earliest tourist days, and still has the most to see and do of anywhere in the park. If you're thinking about staying at Furnace Creek, use this guide to find out all about it. If you're just passing through, you may still want to stop for a meal, to stretch your legs, get gasoline or visit the Borax Museum. If your time is extremely limited and you entered Death Valley by the route we describe, your fastest way out is CA Hwy 190 through Death Valley Junction. From there, if you're going to Las Vegas, follow the signs (which are more efficient then many GPS systems), or stay on CA Hwy 127 and you'll return to Shoshone, one of towns you passed on the way into the valley on this photo tour. Early Death Valley explorers were looking for shiny things like gold and silver, but Harry Spiller knew better. He came to Death Valley looking for a mineral called borax, a white-colored substance containing the element boron. Used for many applications since ancient times, borax is found in large quantities in Death Valley. Spiller made and lost his fortune when he found borax in the valley, but William T. Coleman took advantage of the commercial potential, mining and purifying the borax before hauling it out in wagon trains so long it took 20 mules just to pull them and giving rise to the brand "20-Mule Team Borax." The Harmony Borax Works began production and shipping in the winter of 1883 and 1884 and this equipment processed as much as three tons of borax a day from 1883 through 1888. There's not a stalk of corn in sight at this imaginatively-named spot, but we applaud the creative enthusiasm of whoever named it - and chuckle at how frequently The Devil seems to show up in a valley named death. The plant is called Arrowweed, even though it looks more like a small bush. This desert survivor has adapted to challenging conditions of blowing sand and soil erosion by growing in clumps. At some times of year, they look a little bit like corn shocks - or so some people say. Located on the north end of Death Valley, Stovepipe Wells offers lodging and food, along with a gift shop and gas station. You'll also find a small market that sells snacks and drinks. We've read conflicting accounts of how this place got its unusual name, but all include a hard-to-find well and a stovepipe. Whether early travelers used that stovepipe to line the well or just to mark its location is less clear. The historical marker near the Stovepipe Wells Inn favors the latter explanation. 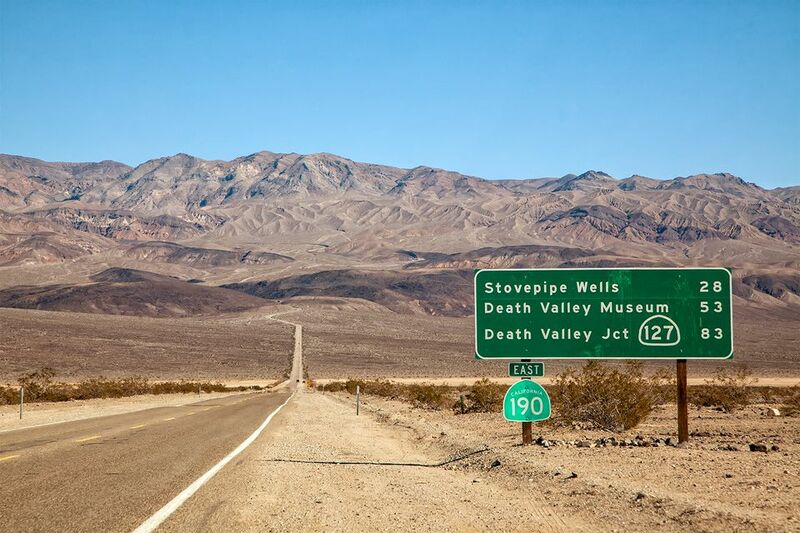 If you're thinking of staying at Stovepipe Wells, use this guide to find out more about it. Located a few miles from Stovepipe Wells and a short hike from the road, the Mesquite Sand Dunes are the tallest sand dunes in California and among the highest in North America, rising 680 feet above a dry lake bed. Formed by wind and sand from the Cottonwood Mountains, the sand dunes cover an area about three miles long by one mile wide. Look closely and you'll see two people climbing them, one wearing red and one wearing black. Located east of the national park on Bureau of Land Management property west of Beatty, Nevada, Rhyolite is the best-preserved ghost town in the Death Valley area. Unique among mining towns, Rhyolite had many buildings made from permanent materials rather than canvas and wood, so there's more to see in this ghost town than in many of the other gold rush spots in this part of the country. At its peak, about 6,000 people lived here. Today, you'll find the well-preserved Bottle House and train depot, along with a three-story bank building, school, jail and store. You'll take a 60-mile (round trip) detour out of the national park to see Rhyolite. To get there, turn east off CA Hwy 190 about 19 miles north of Furnace Creek onto Daylight Pass Road. Turn left at the sign for Rhyolite shortly after you cross the Nevada border. Use the Rhyolite visitor guide to find out how to get there and what you can see. If the road and your vehicle are up to it, you can take Daylight Pass Cutoff and stop by the Keane Wonder Mine on the way. You'll also find the scanty remains of Chloride City about 8 miles east of the main road just before you get to the border. It may sound like something your oddly-named Great Aunt pulls out of her handbag when she's feeling overheated, but an alluvial fan is a geological feature. When water flows hard through a canyon, it carries lots of dirt and small rock with it, spreading out and dropping it when the muddy mess reaches the canyon's mouth. And in case you were wondering, "alluvium" is sediment that was carried by and deposited from running water. This one was photographed from the highway going toward Scotty's Castle, but they're found even on Mars, according to the IAG Planetary Geomorphology Working Group. Ubehebe means "windy place," and it is well-named. Ubehebe Crater was formed in a tongue-twisting event called a cryptovolcanic eruption, a violent explosion of superheated groundwater. We're glad we weren't here when it happened. In geological time, it was just a minute ago, but by our calendars it was about 2,000 years. Hot, molten rock rising toward the earth's surface turned groundwater into steam and like an overheated pressure cooker, the whole thing blew up. The explosion flung rock as far as six miles away, creating the crater which is a half-mile across and 500 feet deep. It's a 30-plus-mile journey (one way) to visit Ubehebe Crater and Scotty's Castle and the only way out on a paved road is the way you came in. They're both interesting sights, but if you're short on time, you can save more than 2 hours by continuing west from Stovepipe Wells toward Emigrant Gap. Named for the oval shape of the flat, dry, lake bed, this place holds one of Death Valley's most intriguing mysteries. The boulders here, some of which weigh up to 700 pounds, move across perfectly flat ground, leaving trails behind them to show you where they've been. This unusual spot is 28 miles southwest of Ubehebe Crater via an unpaved road (high-clearance vehicles recommended). To visit it, you'll need a four-wheel-drive vehicle and most of a day to get in and out. To get there, follow the unpaved road from Ubehebe Crater through Racetrack Valley. Scientists finally figured out how those rocks move so mysteriously, as the LA Times reported in 2014. Unfortunately for everyone who thought it was a beautiful place as nature created it, a driver decided to add their own tracks to those of the rocks as reported by the San Jose Mercury News in 2016. It will take a good rain to repair the mess they made. A flash flood in 2015 washed out the road to Scotty's Castle. It is closed until 2019, according to the National Park Service. When it re-opens, this is a guide to how to visit it. Take Emigrant Canyon Road south from Hwy 190 about 10 miles south of Stovepipe Wells to reach a trio of side trip spots well worth the time. First up is Skidoo Ghost Town, a few miles off the main road. This photo isn't from Skidoo itself, but is the old Eureka Mine which is just off the road. It's well worth the half-hour drive off Emigrant Canyon Road to reach this panoramic vista point which overlooks much of Death Valley from a height of 6,433 feet. This road is not paved, but when we visited, most passenger vehicles with good clearance could make it. However, road conditions can change it's best to check with a park ranger before you go there. If you've just stopped at Skidoo or the Eureka Mine, continue on Emigrant Canyon Road and you'll find the turnoff to Aguereberry Point in about 2.5 miles. Follow the fairly easy, wide trail that runs to the left of the big rock formation all the way to the end for the best views. Just past the Wildrose Campground, you'll find the turn to Charcoal Kilns and Mahogany Flat Campground. Built by the Modock Mining Company in 1877 to make charcoal fuel for silver-mine smelters 25 miles away, these 25-foot-tall kilns are some of the best surviving examples of charcoal kilns in the Western U. S. They're four miles up Wildrose Canyon Road from its intersection with Emigrant Canyon Road. A short stretch of the road going on to Panamint Valley Road is marked "limited access" on some maps. If you go that way, take Panamint Valley Road north to north to rejoin Hwy 190. Panamint Springs is right on the edge of the national park, with a small motel and RV park, restaurant and gas station. If you're thinking of staying there, use this guide to find out more. A few miles past Panamint Springs and outside Death Valley National Park boundaries is the ghost town of Darwin.